Who doesn’t like ice cream during the summer especially when the thermometer hits 40 C degrees mark? We thought it would be a good idea to introduce you to a variety of ice creams which you can get in Spain. Supermarket ice creams are the cheapest ice creams which one can get probably around the world. However, since there are so many and if you come to the new country it might be hard to select the best ones. Satistica.com ran the survey asking 1000 people to name the best supermarket ice creams. The leading Spanish supermarket Mercadona took the first place in the hearts of Spanish supermarket ice cream lovers. Dia and Carrefour took the second and third places accordingly. Thus, if you are going grocery shopping and one of the things on your list is ice cream think twice to which supermarket you should go to. Those are the best! Trust us! Taste of the freshly made ice cream is nothing compared to those industrially made ones. In addition to that, you have a way broader variety to choose from. Spanish people and visitors have their top favorite artisanal ice cream’s flavors. Chocolate, Vanilla Strawberry, Lemon have occupied the hearts of many ice cream lovers in Spain. In addition to the common flavors, Turron and Coffee taste artisanal ice creams are very popular. If you would like to go for not so ordinary cone of ice cream Spain has to offer those for you as well. 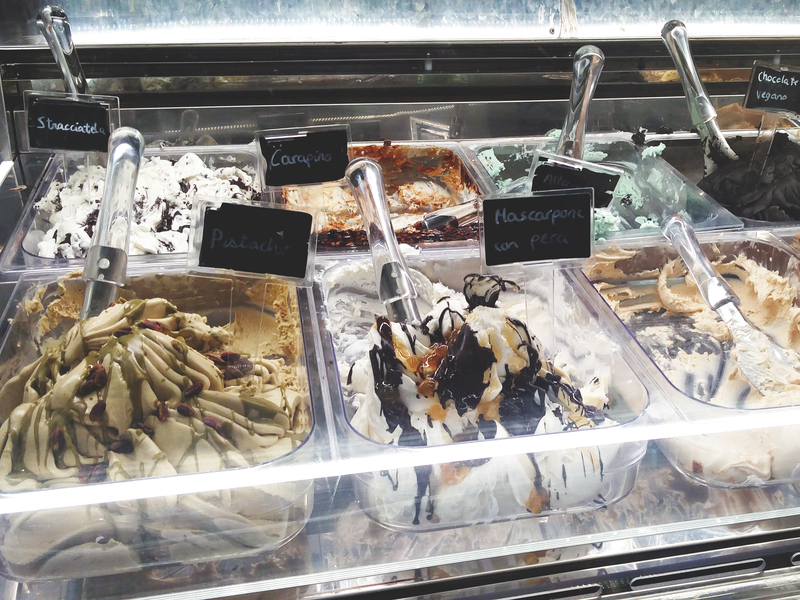 Condensed milk, Cheesecake ice cream, Kinder Bueno and many other flavors can be found at the ice cream shops. Would you like to go for completely odd flavors? In such case, grab cinnamon, saffron, pumpkin, goat cheese, Mojito ice creams if you see them around. Those who are not into a regular texture of an ice cream should take a look at a few alternatives for refreshing their day. You have a wide selection of frozen yogurts and crushed-ice drinks which in Spain are called granizados. Those who are fans of yogurt ice creams in Spain are pleased to have not only tons of flavors to select from but also they can personalize them by adding different toppings and sauces. Crushed-ice drinks are not only refreshing but also has a wide selection of completely natural and healthy choices which are low in calories.